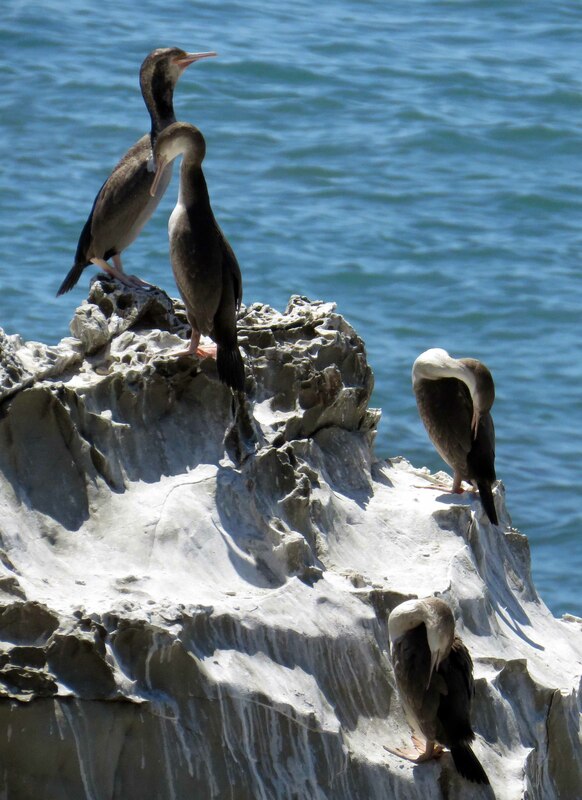 Early January 2019 I went to Kaikoura on a camping holiday-road trip from Wellington, NZ. It was my first trip there post the 2016, 7.8 earthquake – here are a few of the hundreds of photos I took. 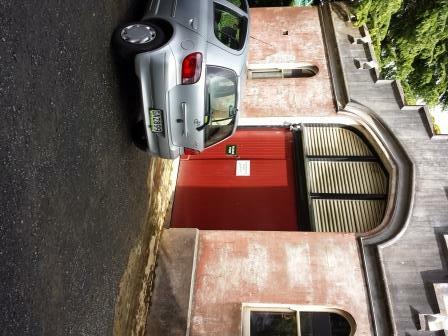 more blogs and pic to follow. 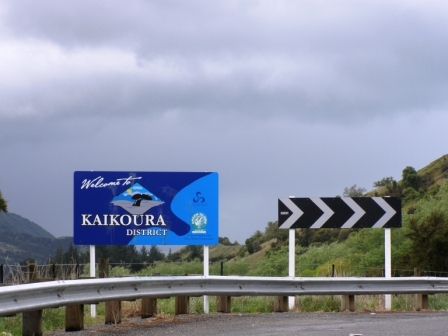 Kaikoura means to eat crayfish – and what a great spot to get some. Crayfish are large and in the lobster family – not the little crawfish of USA. (although that’s what many Americans hear when we Kiwi say ‘crayfish’. Nin’s Bin has been here for years and years! 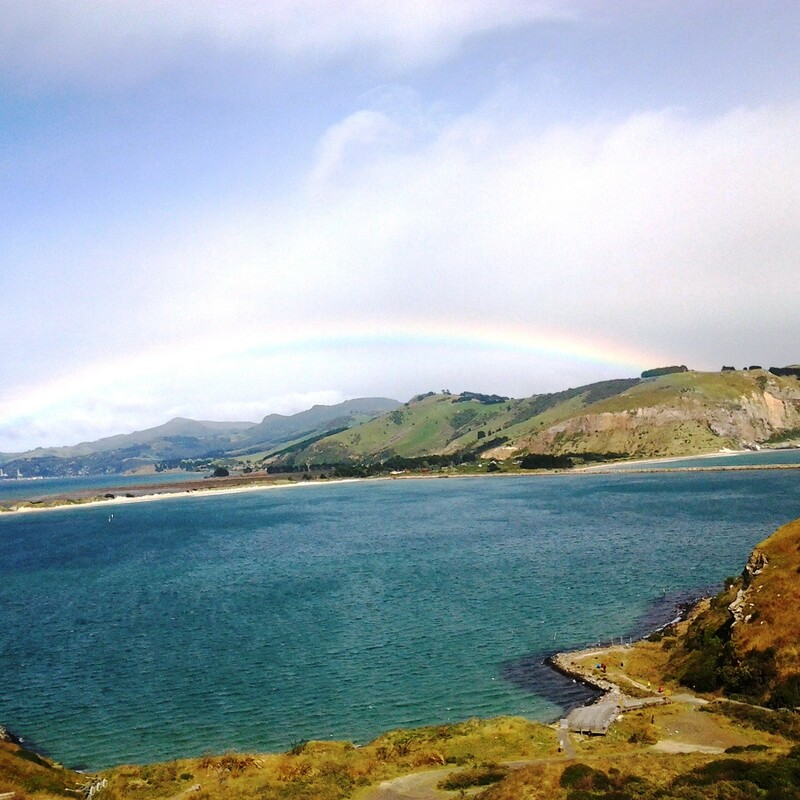 Otago Peninsula was a volcano some 10 or 13 million years ago – give or take a week or two. 65 thousand years ago it became an island when sea levels rose and, more recently, now a peninsula, Captain Cook and the hardy self-sufficient pioneers fought battles along the notorious 2000 kilometres coastline which is now scattered with shipwrecks. With an annual rainfall of 700/800 millimetres and mists that roll in from the sea it now has 5% of the area covered in bush: mainly broadleaf trees and kanaka. Neville Peat a local nature writer based in Broad Bay says the area is a ‘kind of supermarket for marine life, souped up by currents and adjacent deep-water canyons. The accolades continue. Botanist and environmentalist David Bellamy said the peninsula is ‘the finest example of ecotourism in the world’ while Mark Carwardine, zoologist and outspoken conservationist, writer, TV and radio presenter, wildlife photographer, columnist, best-selling author, a wildlife tour operator calls New Zealand a “wildlife hotspot”. He says it’s one of the best places in the world to see great wildlife and recently he was on a whirlwind tour, searching for our equivalent to Africa’s ‘big five’, the New Zealand ‘small five’ endangered species: hector’s dolphin; kea, kiwi, tuatara, yellow-eyed penguin .. all found on or around this amazing outcrop of land. This area is not just a day trip from Dunedin but a place to base yourself – a destination in its own right. So watch this space (make it easy by signing up for email updates on the top right-hand corner of this page) for stories about albatross, penguins, castle, boat trips, fur seals, settlers museum, bus stops, birds, gardens, fabulous cottage accommodation, heritage city walks, the Taieri Gorge train, Chinese gardens, butterfly house and the Orokonui ecosanctuary and more! Joining the Seal Coast Safari, which ‘they’ say is the ‘best tour in Wellington’ I want to check it out again and see if ‘they’ are right. I’m picked up at the Wellington i-Site (downtown visitor centre) along with two other locals – Claire & Alice – both Bluebridge employees. 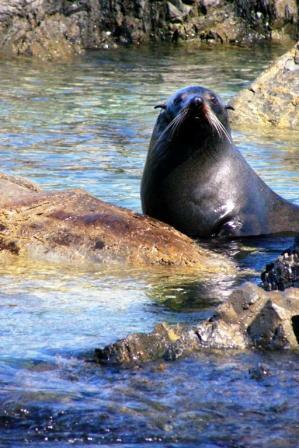 Seems this is the first time our driver-guide, Billy, has had locals-only on the off-road Seal Coast Safari. It’s a compliment when locals love our coast so much we go out in the middle of winter to see it from a different perspective. I get the front seat in the Toyota Cruiser and we’re off – before long we’re at the top of the Zealandia (Karori Wildlife Sanctuary) predator proof fence and site of New Zealand’s first wind turbine: at 33 metres tall it is dwarfed by those built today. It’s amazing that within such a short time we are well out of the city – for non-Kiwi readers, this is New Zealand’s capital, and the site of our parliament. Some of the highlights of the trip for me (apart from my always-favourites, the seals and bird life) were the wildlife which included Kaimanawa horses and domestic deer. The horses originate from domestic horses owned by early settlers and which are now a large (problematic) wild herd in the middle of the North Island. 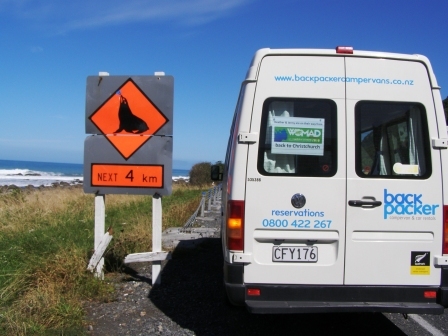 I also loved the views of the city, harbour, Cook Strait and the snow-capped mountains of the wonderful South Island. As you can imagine, traveling along a fault line, and with exclusive access through private land, provided many photo opportunities, and our surf-loving, singing, meditating, and artist (painting) driver loved sharing his knowledge with us. Here are just some of the photos I took during the morning. are … fin-footed carnivorous marine mammals and are distinguished by visible external ears and hind flippers which rotate forward. 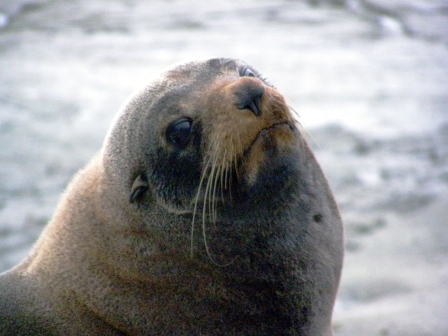 This pointy-nosed seal has long pale whiskers and a body covered with two layers of fur. Their coat is dark grey-brown on the back, and lighter below; when wet they look almost black. 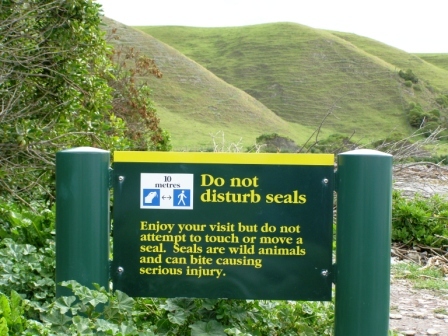 Kaikoura, New Zealand is a good place to see seals easily: read here to see what the NZ Dept of Conservation says about not harassing these (and other) mammals in NZ. Dont get between them and the sea, and keep your dogs on a lead. Just pull over and see the seals!